In 12-inch nonstick skillet, heat oil over medium heat. Sprinkle chicken with garlic, oregano, seasoned salt and pepper. Add chicken to skillet; cook 15 to 20 minutes, turning once, until juice of chicken is clear when center of thickest part is cut (at least 165°F). Stir wine into skillet. Top chicken with tomato slices. Cover; cook 2 to 3 minutes or until tomatoes are thoroughly heated. Add spinach. 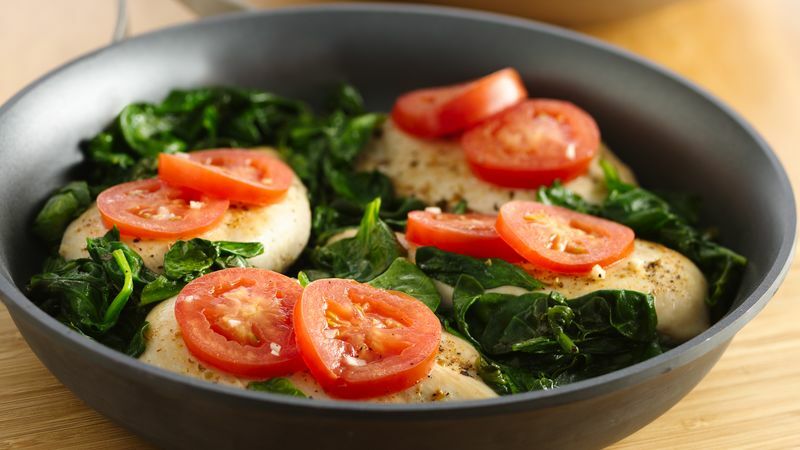 Cover; cook 2 to 3 minutes longer or until spinach is wilted. Brown rice is perfect to serve with this dish. Be sure to spoon some of the sauce over the rice. Then add a side of broccoli to finish the meal.